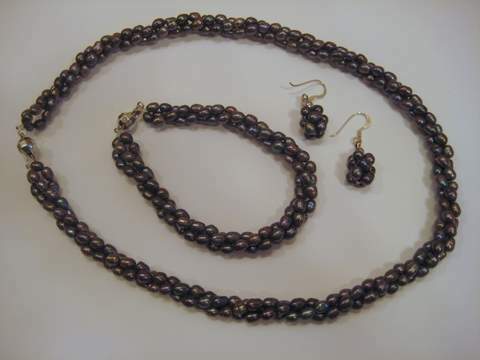 You'll find yourself wearing this charming 2 strand black pearl set every day of the week. Black pearls are not just for evening wear or funerals. This interesting two strand necklace, bracelet and earring set will be just what you're looking for on many days. It can go with so many outfits, not just dressy but casual and for fun times too when you wear your blue jeans. It's always nice to have a complete set and this includes cluster drop earrings, a bracelet and necklace. You'll feel "put together" for sure. It's important to feel good about how we look and nothing gives a boost like wearing pearls! And there's nothing quite like exotic dyed cultured black freshwater pearls. 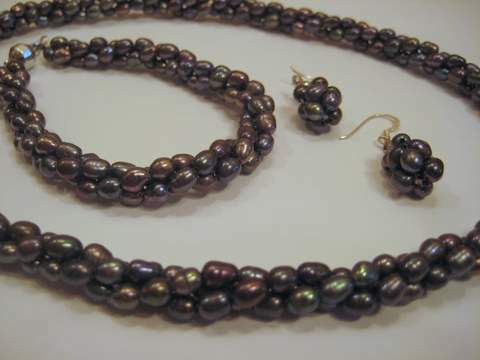 Go to main black pearls page after 2 strand black pearl set.